Growth and Full Body Recovery! Supplements are meant to do just that: supplement. ALLDAYUMAY was birthed from Rich Piana's philosophy that supplements should never take the place of your meals, but rather taken in addition to the food your eat. 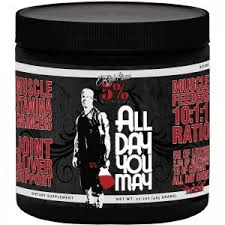 ALLDAYUMAY is one of the most dynamic products on the supplement market today, formulated to aid your muscle building efforts in numerous ways. Who says you cannot feed your body what it needs throughout the day, ALLDAYUMAY! 5%er's will do What Ever It Takes to ensure their bodies are being fed All Day, and know that to train day in- day out at a high level you need more than just amino acids; the whole body needs to be prepared and ready for the next onslaught in the gym! Stay healthy, stay anabolic, stay strong- 1DayUMay! Whoa. You've reached the maximum quantity for this item ().